Note:Please place an FBA order to enjoy the best amazon service! If you place a seller-fulfilled order and can't receive it NEXT DAY, please ask for a full refund when the order arrives and you can keep the order! * 2 Double Spreads of Yearly plan consisting of 4 small blank boxes for each month and a 'Project' column. Unlike some of your more heavy-duty planners, this planner is small enough to carry with you throughout the day. The size is between A6 and A5, which is a good size for many people. This personal organizer is very cute with the pictures inside and colourful. Because it's hard-back, it has this professional look about it. Premium paper reduces ink bleed through. 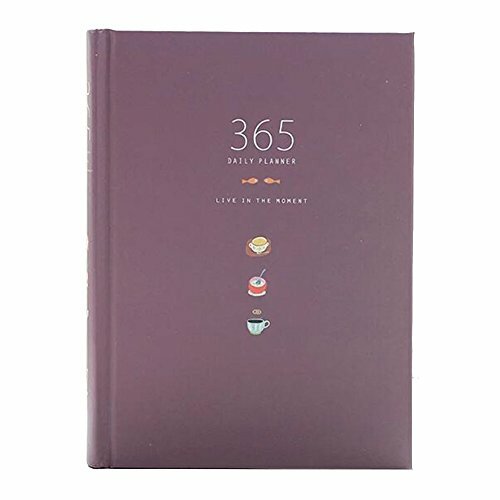 It allows you to fill in your own dates so it doesn't matter when in the year you purchase this notebook, you can start it from any date! This is good if you want to skip on a few days if you don't have anything planned. Great for keeping organised, planning tasks and keeping track of any goals you set yourself. If you have any questions about this product by Duckart, contact us by completing and submitting the form below. If you are looking for a specif part number, please include it with your message.